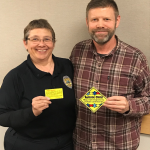 For the past few years, the Post Falls Police Department has offered free “I have Autism” cards for citizens, to help law enforcement professionals that may unexpectedly encounter or be asked to find a person with autism. Recognizing the behavior symptoms and knowing contact approaches can minimize situations of risk, or victimization of the person with autism, and risk to the officer. We may learn the person has autism from dispatch, family member or someone at the scene, or the person himself or herself. Detective John Mason and Crime Victim Advocate CJ Jones recently came up with the idea of handing out stickers as well. The bright yellow “Autistic Child” stickers can be utilized at your residence or even on a vehicle to notify first responders of the potential of dealing with someone with autism in any situation a sticker is present. If you would like to pick up a sticker or free Autism ID Card, please come down to the Post Falls Police Department. We’re open 24/7 and located at 1717 E. Polston Avenue in Post Falls. The Autism ID Card helps people on the autism spectrum explain their medical condition to police, EMTs, and other first responders when contacted. People on the autism spectrum can present the Autism ID Card to emergency personnel to inform them about their diagnosis and notify who to contact for assistance. 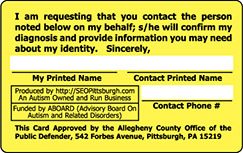 SEO Pittsburgh, a web development company owned and operated by individuals on the autism spectrum, developed the Austim ID Card. Due to the stress of an emergency situation, people with autism are frequently unable to communicate the nature of their condition, and first responders may misinterpret their behavior. For more information about the Autism ID Card, go online to http://autismidcard.com/ .